The UN nuclear watchdog chief said on Wednesday he had given Iran and three world powers a draft text of a deal for approval by Friday to help allay concerns over Tehran's nuclear program. International Atomic Energy Agency director Mohamed ElBaradei spoke at the conclusion of two and a half days of difficult politically charged talks involving Iran, France, Russia and the United States at IAEA headquarters. Diplomats said ElBaradei's draft contained the powers' call for Iran to send some 75% of its enriched uranium reserve abroad before the end of this year for conversion into fuel for a Tehran reactor producing medical isotopes. This would reduce the high risk cited by the West of Iran, under suspicion over nuclear secrecy and restrictions on IAEA inspections, using a growing low-enriched uranium stockpile to refine to high purity suitable for atom bombs. Iran's delegation chief did not say whether Tehran would endorse the draft deal. Iran denies seeking nuclear weapons. Its delegation chief said the Vienna talks were constructive but did not say whether the Islamic Republic's leadership would endorse the draft accord. "I have circulated a draft agreement that in my judgment reflects a balanced approach to how to move forward. 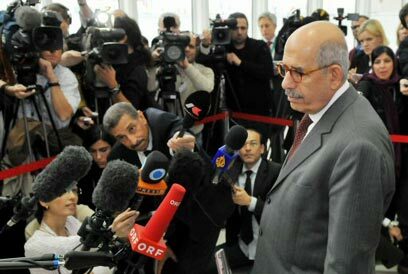 The deadline for the parties to give, I hope, an affirmation action is Friday," ElBaradei told reporters. "I cross my fingers that by Friday we have an OK by all the parties concerned," he said, underlining uncertainty whether Iran would come on board after it cast doubt on details of the deal it tentatively agreed to in Geneva talks on October 1. "Everybody is aware (this) transaction is a very important confidence-building measure that can defuse a crisis going on for a number of years, and open space for (further) negotiations" on other outstanding disputes, ElBaradei said. "There have been a lot of technical, legal and policy issues, issues of confidence and trust and that is why it has taken us some time and that is why we need to send the agreement to capitals for final approval," he added. "I very much hope that people see the big picture, that this agreement could pave the way for a complete normalization of relations between Iran and the international community." ElBaradei said France was part of the deal drawn up after exhaustive consultations with the parties, despite Iranian statements saying Paris must be excluded and accusing it of reneging on past contracts to deliver nuclear materials. Diplomats said a face-saving compromise had been drafted by ElBaradei. Under this, Iran would sign a contract with Russia which would then sub-contract further work to France. The Vienna negotiations offered the first chance to build on understandings struck in Geneva to defuse a long standoff over fears Iran's stockpiling of enriched uranium is a latent quest to develop atomic bombs, not fuel for electricity as it says. Western diplomats say Tehran must ultimately curb the program to dispel fears of a growing LEU stockpile being further enriched, covertly, to produce nuclear weapons. But senior Iranian officials said this week Iran would not curtail enrichment as part of any LEU deal. LEU is used as fuel for nuclear reactors, while a nuclear bomb requires highly enriched uranium. See all talkbacks "Iran agrees to draft deal on uranium "